Participants of the Russia Country Seminar at the Vibrant Gujarat Forum, Jan. 11, 2017. Russia’s 60-member delegation to Vibrant Gujarat-2017 in Gandhinagar was its largest since the inaugural edition of the summit. At a business forum on the sidelines of the summit, the countries discussed ways to increase bilateral trade, which fell to $6 billion in 2016 from $7.8 billion a year earlier. Russia and India have reiterated their commitment to strengthen trade and economic partnership to re-energize the business relationship between the two countries that has been very slow to take off. The issue was discussed as a matter of high priority during the meeting of Russia-India Business Forum on the sidelines of 8th edition of Vibrant Gujarat Global Summit, in Gandhinagar, from January 9 to 13. At the forum, the two sides exchanged opinions on their joint experience and considered the prospects of cooperation, including regional cooperation, in trade. 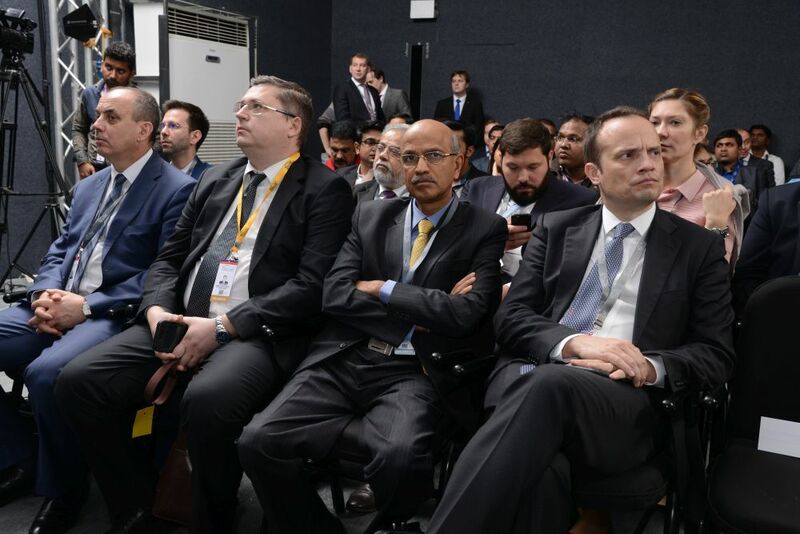 Russian Deputy Prime Minister Dmitry Rogozin, the point-man for Russia-India cooperation, led the 60-member government and business delegation to the summit, where Russia showcased its impressive industrial achievements, with a huge potential of investments in India. The Russian delegation also included high-level officials from Tatarstan and Astrakhan regions, which have already established strong economic partnership with Gujarat for decades. Astrakhan, in particular, presented opportunities of its Lotus special economic zone (SEZ) to the Indian business leaders. Over a dozen Russian companies and organizations represented Russia at the summit: Among them, the Emergency Situations Ministry, Sibur, Novatek, Rosneft, Roscosmos, Rosatom, Rostech, Schwabe and Russian Helicopters company. This was the largest-ever participation of business companies and organizations from Russia since the first Vibrant Gujarat Global Summit. This also showed the great importance Moscow gave to the business summit, especially in relations to the trade and economic cooperation between Russian regions and Indian states. On the eve of the inauguration of the summit, Rogozin met with Indian Prime Minister Narendra Modi and discussed different issues of bilateral economic partnership in the mutual interest of “special, privileged” strategic partnership. The two leaders, in particular, stressed the continuous progress in the civil nuclear energy and hydrocarbon sectors, including Rosneft’s investment in the Vadinar refinery, cooperation in the automobile sector and cooperation between Astrakhan region and Gujarat, a sister-state of Astrakhan. On Jan. 9, Modi also visited the Vibrant Gujarat Global Trade Show to see the Russian pavilion where Rogozin demonstrated him, the ‘Safe City’ hardware and software system designed by Russian specialists. “Gujarat is truly vibrant and Russia is looking forward to manufacture high-tech machinery in India,” Mikhail Mamonov, Managing Director for Priority Projects, Russian Export Centre, said. The primary focus for Russia is three industries in Gujarat – hi-tech machinery, energy and setting up helicopter manufacturing unit. Mamonov added that besides cutting-edge technology, Russia would also like to partner with Gujarat in agricultural products, fertilizers and petrochemicals in Gujarat. According to Russian Trade Representative in India Yaroslav Tarasyuk, there is a huge interest in Russia among Indian companies, mainly among chemical producers, pharmaceutical companies, manufacturers of fertilizers and agricultural producers. “Such active participation of the Russian delegation on a regional forum is not happening for the first time, but still it’s a rare event,” he told RIA Novosti. During the Russia-India Business Forum on Jan. 11, the sides agreed to speed up negotiations on a Free Trade Agreement (FTA) between India and the Eurasian Economic Union (EAEU) this year. Trade between India and Russia stood at about $6 billion in 2016, compared to $7.83 billion in 2015. Tarasyuk also called for India-Russia trade to shift to settlements in local currencies. In October 2015, India and Russia created a special Joint Working Group (JWG) to develop an appropriate mechanism for ruble-rupee trade. According to sources in the field of bilateral diamond trade, India is soon expected to implement regulations to eliminate the intermediaries in the import of rough diamonds from Russia with the aim of expanding bilateral trade and boost the diamond industry, which employs millions of traders and workers in Gujarat. The Indian government has also shown special interest in developing ties with Astrakhan region with hundreds of ethnic-Indians from Gujarat involved in the diamond industry for centuries. During the India-Russia annual summit in Goa, in October, Modi discussed with Putin the measures India is considering to simplify the taxation and customs procedures to make it easier for Russian traders to export rough diamonds to India directly.